IC 1805, surnommée la nébuleuse du Cœur, est une nébuleuse en émission située à environ 6 500 année-lumière dans la constellation de Cassiopée. Elle couvre un champ d'environ 60 minutes d'arc, ce qui correspond approximativement à 200 années-lumière1. The Heart Nebula, IC 1805, Sharpless 2-190, lies some 7500 light years away from Earth and is located in the Perseus Arm of the Galaxy in the constellation Cassiopeia. 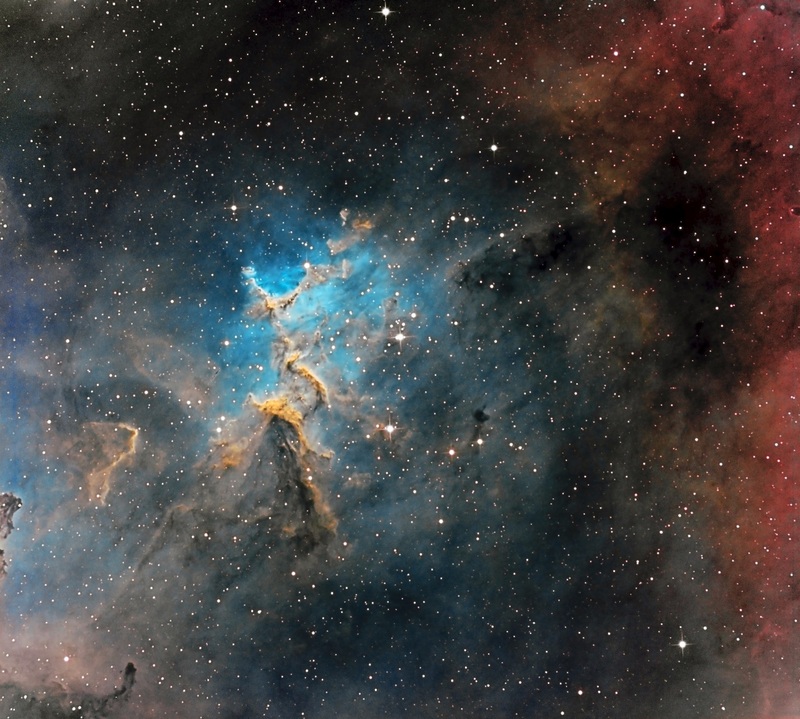 This is an emission nebula showing glowing ionized hydrogen gas and darker dust lanes. The very brightest part of this nebula (the knot at the western edge) is separately classified as NGC 896, because it was the first part of this nebula to be discovered. The nebula's intense red output and its configuration are driven by the radiation emanating from a small group of stars near the nebula's center. This open cluster of stars known as Melotte 15 contains a few bright stars nearly 50 times the mass of our Sun, and many more dim stars that are only a fraction of our Sun's mass.